Often in movies about individuals who strive to make a living telling stories the process of capturing the true essence of such lives strays from the actual topic of why the way these particular people tell stories is so special. What it actually takes to get from a lyric to a melody to an arrangement or in whatever order inspiration decides to strike is completely glossed over. With A Star is Born, Bradley Cooper goes from movie star to film director, screenwriter, musician, and songwriter with no doubt countless other titles one could heap upon him. While there are plenty of leading men-types in Hollywood these days what has always allowed Cooper to stand apart is his full immersion and commitment to each and every role he takes on. Given as much, it then felt inevitable that Cooper would bring such qualities and thus the same level of commitment to these new, more principal, roles. 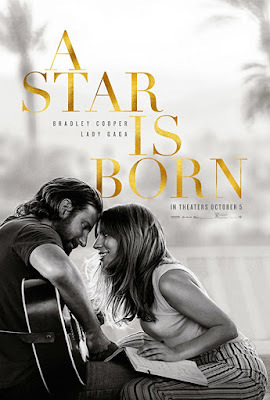 In taking on these new roles though, and applying them to what is the fourth incarnation of A Star is Born Cooper has seemingly found a way to work through the finding of his artistic voice in a thinly veiled metaphor of sorts via the world of musicians and the music industry in place of Hollywood and the studio system. While past incarnations of the film have dealt specifically with actors and featured no music whatsoever 2018's A Star is Born is not so much a re-make of the previous versions as much as it is a familiar set of archetypes by which Cooper can work through his creative process by exploring the creative process. I say all of this having only read about the past films while having decided to not watch any of them prior to seeing this latest version so as to have as little precedent or expectation of what should come to define it. The point being, A Star is Born never struck me as a movie about the rise of a young and talented artist through the ranks of fame, but more as an exploration of more introspective shades of fame e.g. why some people and not others are "famous" despite the likely fact one may possess more talent than the other. Someone might be a technically proficient singer, so why would they not aspire to sing? Okay, but do they have something to say and not only that, but do they have a way to say it that will make people shut up and listen? This main idea works as both a throughline for Cooper's film as well as his own trajectory as an artist who has to figure out if how he wants to say something in fact merits this fourth incarnation of a well-worn story. In short, 2018's A Star is Born has plenty to add to the conversation. Jack (Bradley Cooper) convinces Ally (Lady Gaga) to join him on stage to sing a song she wrote. It should be noted that I'm a sucker for movies about musicians. I was someone who always desired to live this life, to be able to tour the world, and support myself and my family by creating song after song and sharing them with the world. I've had small tastes of what it must feel like to come off the high that performing in front of massive audiences must bring every night only to be brought back down to reality by having to go back to a minimum-wage customer service job the next day. I've dreamt of being able to so effortlessly pick up an instrument-any instrument-and compose the way Cooper's Jack or Gaga's Ally does here, but-in another point of deep understanding with the picture the film presents-was always relegated to watching my brother inhabit that side of the talent pool. I wrote lyrics, I hummed melodies, but when it came to crafting a genuine *tune* it was he who truly had the talent for finding a way to say something people would undoubtedly listen to. I never had the actual talent to match my ambition, but I had enough talent and enough talented people around me that were kind enough to include me and thus get a sense of what I wanted out of life. While those heights have not and will likely never be reached it is such experiences as this that only because the experience of witnessing something like A Star is Born to hit that much harder. The film, in essence, chronicles the rise of a singer who had once given up on her dream and the path she crosses with that of a burnt out southern rocker; their paths intersecting on her rise and his fall. This is the skeleton of what Cooper and co-writers Will Fetters (a couple of Nicholas Sparks adaptations) and Eric Roth (Forrest Gump) are working with, but it is in the minutiae of this rather broad description that the trio really find their story and that director Cooper really discovers his knack for honing in on what really stands out about his presentation of these familiar archetypes. 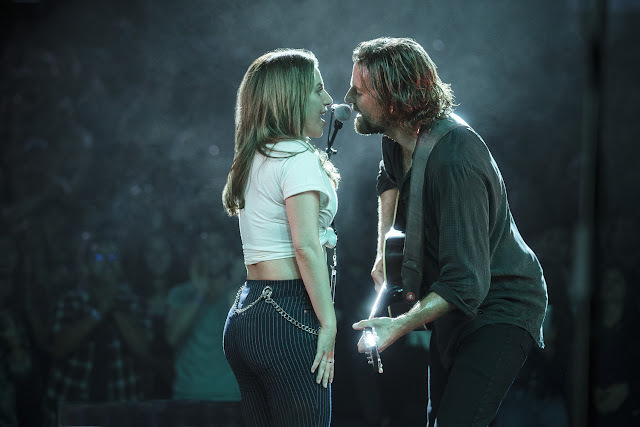 In the case of this particular A Star is Born what stands out most is the chemistry and therefore the love story between the two principal characters. This is only emphasized further by the dynamic the context these characters find themselves in presents. From where Cooper's Jackson is coming from, the world he brings Gaga's Ally into, and how it catapults her past not only where he's at, but seemingly past where he's ever been given the crossover from one genre to another. Thankfully, both the screenplay and Cooper's direction don't ever send this scenario down the road most traveled in that Jack never becomes jealous of Ally's success as fame was always a by-product of doing what he loved, but rather it becomes more a question of authenticity for Jack and not letting Ally sacrifice hers for the gain of the label at her artistic expense. Pepper in themes of depression, addiction, and daddy issues that runs throughout in regards to Jack's character and Cooper and co. have more than enough to dig their guitars and southern drawls into. Beginning with the performances it is in Cooper and Gaga's representations of their characters that the film is truly defined. As much as Gaga is the powerhouse vocalist and almost overpowering in her presence as a performer not to mention the meta aspect of it all (to see Gaga play a persona so opposite that of her Gaga persona is both a peak behind the curtain and a testament to her talent) it is Cooper who is initially the most charismatic presence in the film and the one that draws us into the world just as he does Ally. Jackson Maine is a rock star who likely had a string of hit singles a decade or so ago and has continued to tour ever since and gets lucky with the occasional contemporary hit on country radio from time to time. The touring is where the money's at though and for Jack specifically it is where the guy is able to escape his demons. The routine of going out on stage every night to binge everything he feels has become so necessary that were it to be taken from him it's hard to imagine he'd survive too long after. Even this sacred routine is being threatened though, as Jack's older brother, manager, and tour manager, Bobby (Sam Elliot), is pressuring him to wear inner-ears during his shows so as to not damage his ear drums more than he already has. Jack-whether it be an act of defiance or true conviction-refuses to put a barrier between himself and the only thing that keeps his blood pumping though. As a result, the middle-aged rocker is going deaf and to make matters worse is drinking himself half to death both before and after he exits the stage. He lives for the thrill of performing live, but he survives by the grace of a constant drink. It is upon his quest for another drink after having run out of his personal stash that he seeks out a local bar that unbeknownst to Jack is a drag bar that happens to be where Gaga's Ally performs on Friday nights. Ally, who was once a waitress at the bar has moved on in terms of occupation (but not far off as she and Anthony Ramos' Ramon now work as part of the wait staff at an upscale establishment), but is still the only woman allowed to come and perform with the rest of the queens on these Friday nights. Ramon coaxes Jack into the bar and convinces him he has to hear his friend sing. Little does Jack know this encounter will not only change the course of his life, but will significantly alter the outlook the heavily sunburnt and egregiously gin-soaked rocker has on his existence as well. 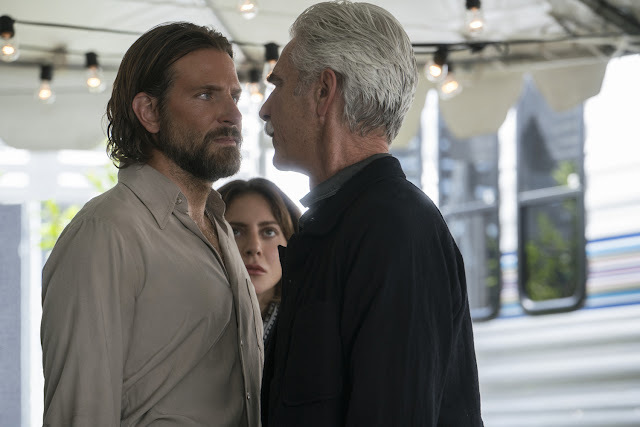 Cooper inhabits Jack in a way one isn't even aware Bradley Cooper exists, but instead we become fully convinced that Jackson Maine is a living, breathing soul that is teetering on the edge of self-destruction before he finds a reason that might be reason enough to continue fighting the good fight. Jack confronts his brother, Bobby (Sam Elliot), in Cooper's directorial debut, A Star is Born. As Ally, Gaga is as natural and in control as one could hope, but that one would never expect a rather novice pop star to be when it comes to acting. Just as before, it should be noted that I've been a fan of Lady Gaga's since I first saw the music video for "Just Dance" in an American Eagle ten years ago and knew from those first moments given the type of music she was making combined with the cheeky images to go along with it that she "got" it. She understood and still understands the power of imagery and persona as an artist and how these and a sense of mythos resonate to a higher degree than that of baring it all as a girl and her piano. Gaga, the artist, has had to acclimate several times to the shifting trends and styles over the last ten years, but aside from a misstep here or there Stefani Germanotta has largely adapted in ways that have only made her brand that much more powerful and that kind of aura Germanotta has created in Gaga only continues to grow with her talent only being re-affirmed once more in A Star is Born. Gaga could have very easily played Ally as an autobiographical role, but Ally is very clearly not Gaga and that is evident from the moment we watch Ally take the trash out at her aforementioned wait job where she has become complacent in this role of a day job that helps pay the bills while her father, an equally complex if not extensively explored Andrew "Dice" Clay, runs his chauffeur business out of the house they share together. Ally is a thirty-something non-starter who has been told that despite her voice and songwriting abilities that she simply doesn't have the look to make it in show business. Gaga portrays this crushed mentality with a wide-eyed innocence that allows for everything Jack opens her eyes to in his world to not only be admired and charmed by, but appreciated in the sense she never feels entitled to any of it simply because of her talent. It is the fact that in her arc she never loses this combination of innocence and reverence that lends Ally this endearing quality while Gaga also enables the character with a thick skin who has seen so many promises come and pass that her expectations are all but nothing. So, when things do begin to actually take off and Ally has to not only guide her relationship with Jack in the sense of a normal romantic relationship, but also in regards to the fact she is surpassing the man she loves and the man that opened the door for her to reach such heights to become not just who she is as a person, but as a symbol there is fertile ground for Gaga to not only show her range, but for the movie to explore these more introspective aspects of fame as mentioned earlier. It is in these quiet moments between Ally and Jack that sometimes take place in the loudest of environments-often in the midst of a performance-that convey the honesty of what Cooper seems to be chasing with his A Star is Born; this idea that even when two people genuinely love one another with nothing to come between that love other than the circumstances of their lives-that sometimes even that kind of love has trouble surviving. As cheesy as it sounds, it's a pure and rather simple love story made so by the bond over those twelve notes between any octave that can be conveyed in any number of ways AKA the love of crafting engaging stories. There is a line in the film that refers to these same twelve notes that make up every song ever made that refers to each and every one of them essentially being the same story told over and over again and how all any artist can offer the world is how they see those twelve notes. A Star is Born is about two people who love the way each other see those notes. To this extent, it should also be noted that the music in the film-all sixteen original tracks-chart the narrative as well as one could hope with the same kind of ownership and authenticity that both Gaga and Cooper exude in any moment they're singing them. Standouts are obviously those that have been promoted in the trailers such as "Maybe it's Time" and "Shallow," but other tracks such as "Always Remember Us This Way", "Is That Alright? ", and "I'll Never Love Again" are each powerful reminders of the themes at play and the love between these two broken souls. The songs combined with the way in which Cooper and cinematographer Matthew Libatique capture the live performances always from the perspective of being on or to the side of the stage create a thrilling experience from top to bottom every time the film decides to venture in front of a crowd. One would feel remiss to not mention Dave Chapelle as he is quite here, but is only featured in such a capacity that his contribution isn't what stands out as one of the more memorable aspects as you're leaving the theater. And sure, while the introduction to the world of Jackson Maine and the rise of Ally's fame give the first hour an undeniable momentum with the second hour stalling intermittently as it tries to navigate Jack's addiction issues and how it correlates to issues with his equally alcoholic father, the film nails the ending in a way that is so devastatingly heart-wrenching it's impossible to not feel everything that has come before it.